The Adventures of Tioga and George: So Many Projects ! 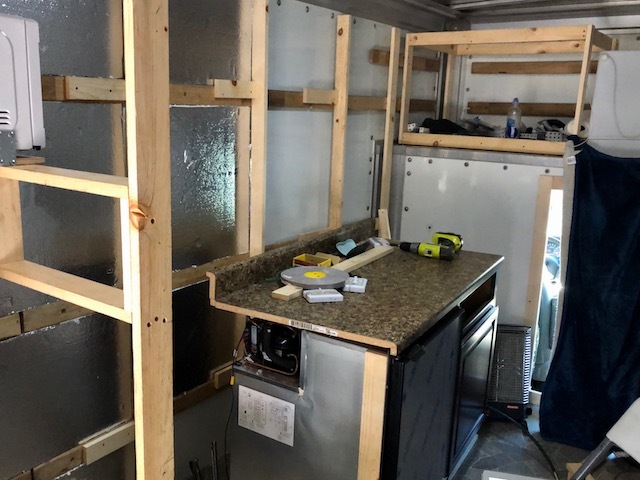 A project as large at my Box Van conversion has many sub-projects. Which one of these sub-projects should I work on? 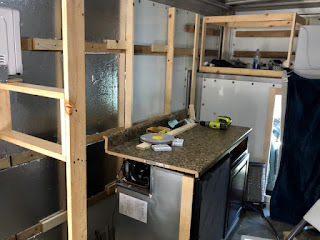 Yesterday afternoon I wanted to install the wall frame behind my kitchen counter., In order to do that install, the counter, the cabinet, and the attached Nova Kool fridge had to be moved out of the way. While moving the counter etc, I noticed that the height relationship between the kitchen cabinet and the Nova Kool fridge was wrong. The Nova Kool was low! While adjusting the height relationship, I decided that this would be a good time to use Nova Kool's stainless flanges. for connecting up to adjacent appliances. These flanges make the installation look clean and professional. 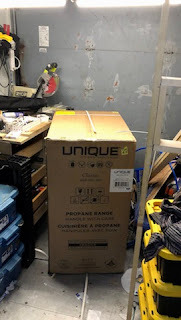 Then I noticed that adjusting the height relationship the way I was doing it would cause the bottom of the Nova Kool to fail to clear the incoming propane gas line. In order to clean the gas line, the Nova Kool would have to be raised about an inch more. to stick to doing one thing to completion. 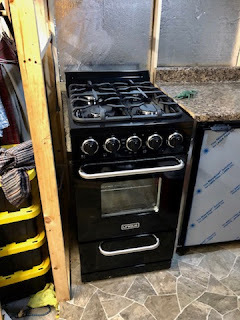 My Unique gas range arrived at John & Mimi's home around 2:30 this afternoon. I drove to the Home Depot in the City of Lemon Grove to install it. The range was extremely well packaged! I had to work a bit at removing the range from the carton and packing insulation material! 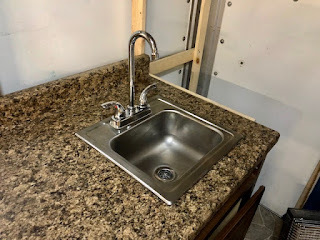 My sink is now in the counter! Man-O-Man! This has been quite a day! You said it sooooo right, Mister Ed! ........If my life will keep throwing Box Van like things at me, I will continue to be the happiest guy on the face of the Earth! Wow!!! I really like that range. So where are you going to install the grey water tank? Nowhere! There will be only a grey water bottle located underneath the kitchen sink. I have not decided yet, whether that will be a 1-gallon or 3-gallon bottle. 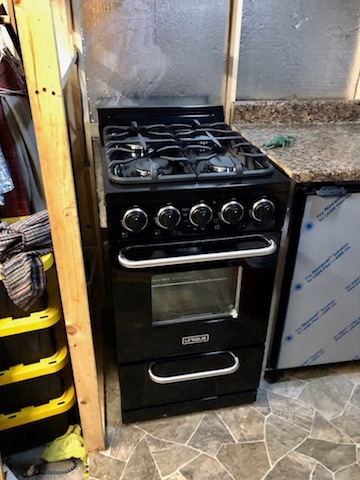 That stove unit is a beauty. The one that came with our 2016 fifth wheel unit is very jealous. Yours looks like the grates are really strong and built well enough that they will not warp or bend with weight on them.